TreeSync, for those who don’t know, is the feature of Family Tree Maker (FTM) that allows it to sync with family trees on Ancestry.com. At least, it was. 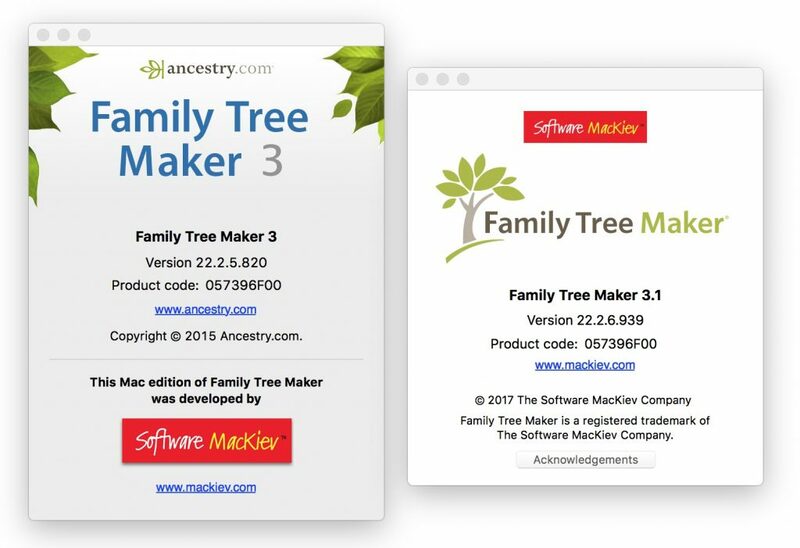 Ancestry stopped selling FTM in 2015 (see Ancestry just killed off Family Tree Maker and Managing the FTM transition), then sold it to Software MacKiev (their existing partner for publishing FTM on the Mac) in 2016 and announced that RootsMagic would also sync with Ancestry family trees (see Ancestry comes up with solutions for FTM users). Over the past year that Software MacKiev has owned FTM, they’ve come out with a single small update that mostly fixed things behind the scenes, and updated the software so it showed Software MacKiev as the publisher. If you look at the above About boxes, you’ll noticed that as it is the Mac version, both were actually created by Software MacKiev, although they were the publisher only in the newer version. Yesterday, Ancestry announced that TreeSync would cease to work on March 29, just 9 days later, and would be replaced by a feature called FamilySync in FTM. 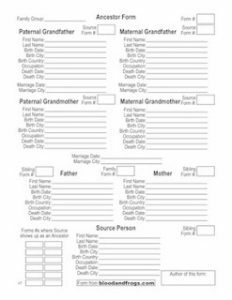 In order to use FamilySync, however, you would need to upgrade to a new version of FTM. 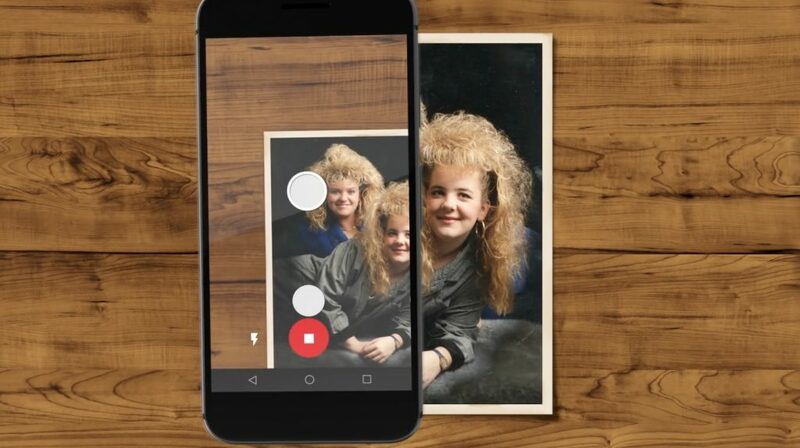 That upgrade costs $29.95 if you order in advance of the release, and will cost $39.95 when the software is released (expected to be on March 31). While I am an owner of FTM, and even upgraded to the latest version just a couple of months ago, I still have not received an e-mail from Software MacKiev about the upgrade. 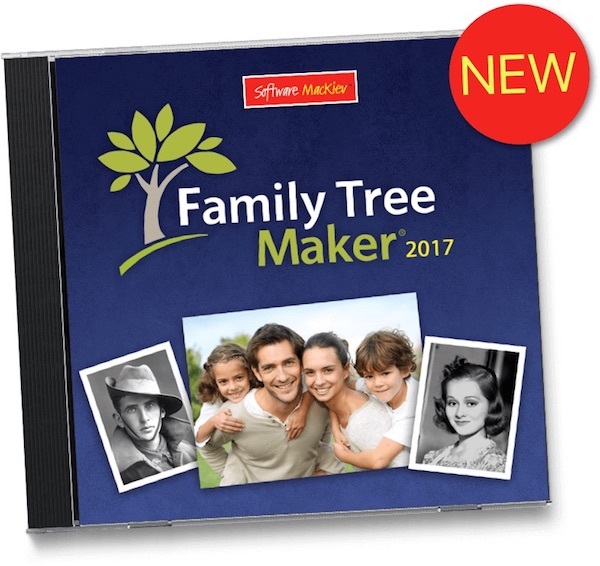 They now have two pages on their web site, both updated today, about the upgrade – Family Tree Maker 2017 FAQ and FamilySync to replace TreeSync in FTM 2017. MacKiev says the upgrade was announced simultaneously with Ancestry yesterday, although that’s strange since I haven’t received an e-mail yet. Who did they announce it to if not their customers? Were they planning to wait until after the $10 discount is over? In any case, it is strange that they’re only giving customers 9 days to do a paid upgrade in order to keep a major feature of FTM. This reminds me of the way a lot of people felt when Ancestry first announced that they were stopping the sales of FTM back in 2015 without giving customers any kind of transition plan. Also strange is that Ancestry did not mention the status of RootsMagic’s integration with Ancestry. 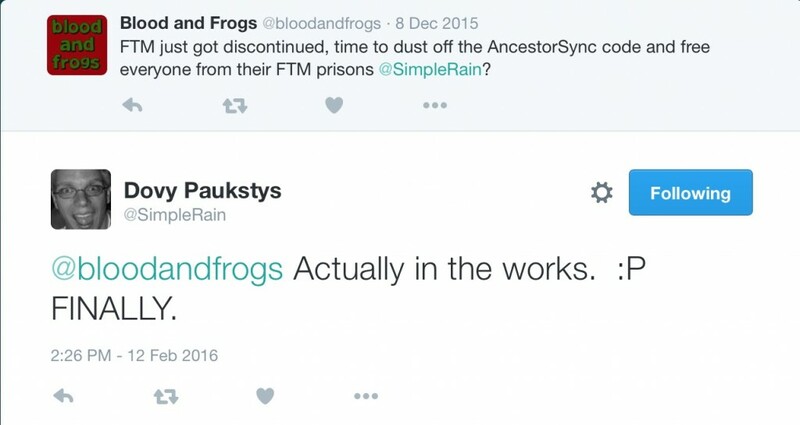 Both FTM and RootsMagic were supposed to be using the same method to sync with Ancestry, and while it’s not up to Ancestry when RootsMagic releases its version with support for syncing, one would think they would at least mention that it would be supported by RootsMagic soon as well. It’s especially strange since RootsMagic previewed their sync feature, called TreeShare, on their blog earlier this month. In addition to the ‘new’ FamilySync feature, the new version of FTM (dubbed FTM 2017) also includes integration with FamilySearch, a ‘color coding’ feature and a photo editor. If you’re interested in upgrading to the new version, and like me have not gotten an e-mail yet, you can get the upgrade by going to one of the following geographic-based edition links – United States, Canada, Europe, and Australia. Apparently these editions correspond to which version of Ancestry you are subscribed to, and you need to have the correct edition that matches the version of Ancestry to which you subscribe. I’m not sure what would happen if you bought the US version (the cheapest by the way) and tried to connect to a different version of Ancestry. I previously mentioned the cancelation of Ancestry’s Family Tree Maker (FTM) software, and also wrote about options for transitioning to other programs for FTM users. One of the things that surprised me was how Ancestry had not seemed to think about the users at all and how they would move on beyond FTM. They had long claimed that FTM was the most popular desktop genealogy software, and yet they’d let this large user base to drift in the wind, so to speak. The right way to have done it would have been to figure out a transition plan, found a buyer for the program, or opened up their APIs to other programs, etc. all before getting out of the desktop software business. In my original post, I hoped they would come up with solutions in the year between their announcement and the final discontinuation of the product. It seems that now they have. It would have been better to have done this before their announcement, but at least they’ve done it. Ancestry announced on their blog that they’ve come up with two official transition options for FTM users. The first solution is that they’ve sold the actual FTM program to Software MacKiev, who had already been producing the Mac version of FTM for several years. 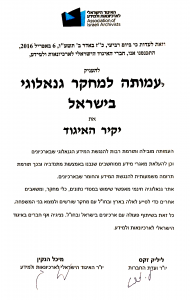 Now they will be responsible for both the Mac and Windows version of the program. Software MacKiev is a well-established software developer from the Ukraine, with offices in Boston, MA as well. Software MacKiev is known for producing the current Mac versions of some early software programs like The Print Shop (originally published on the Apple II) and Mavis Beacon Teaches Typing (originally on DOS). The second solution is that they’ve allowed a third-party genealogy software company, RootsMagic, to access the same APIs as FTM. This means that the RootsMagic program will be able to search Ancestry.com, get Ancestry hints, sync data with trees on Ancestry.com, and perhaps most importantly for FTM users, will be able to directly import FTM files instead of needing to export first to a GEDCOM file. While RootMagic does mention syncing with Ancestry, they have specifically left out Ancestry’s trademarked term TreeSync. This makes me wonder if they will be able to sync in the same way that FTM syncs, or if they will need to upload the entire tree each time there is a change. It remains to be seen if Ancestry plans to offer access to their APIs to other genealogy software companies. In my post on transitioning from FTM, I listed eight different desktop genealogy programs, all that could potentially partner with Ancestry for the same access, with the exception of Family Tree Builder, from MyHeritage. It wouldn’t make sense for Ancestry to work with MyHeritage since it is one of Ancestry’s major competitors in both online trees and more importantly online research. I suspect Ancestry will probably not add new partners this year. 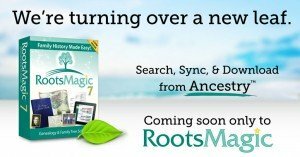 They’ve already said RootsMagic will support Ancestry by the end of the year, and I imagine they want to get that working well before adding new partners. The real question going forward is how two third-party companies are going to move forward with accessing what were previously private Ancestry APIs. Software MacKiev has already worked with these APIs, so they’re ahead of the game. What happens when one company or the other needs a change in the API? or when Ancestry changes something that breaks an API? What about when Ancestry adds a new feature that would be helpful if accessed via the APIs – will Ancestry be adding it to the API? 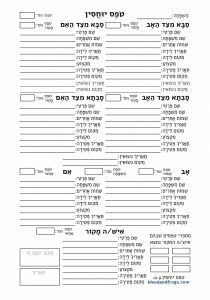 Ideally all three companies (Ancestry, Software MacKiev and Rootsmagic) have some kind of committee in place to handle these issues. If Ancestry expands access to their APIs to more companies, these issues will only become more complex, so I hope they’ve figured out a plan for these issues already. So thank you Ancestry for coming up with solutions for your FTM users. Yes, it would have been better to do this before your announcement in December, but better late than never.